As I was writing it, I hesitated over the word being, before playing safe with the uncontroversial (ˈ) biːɪŋ. The reason is that I tend to relax the first vowel in this word, producing something more like (ˈ)bɪ(ː)ɪŋ. I can do the same with the phonetically comparable seeing, freeing, agreeing etc., and across word boundaries in phrases such as three in a row, three exams. In fact I can optionally do this whenever iː is followed by another vowel. This process (or ‘rule’) is optional and variable, presumably influenced by stylistic factors that I cannot quite pin down. It’s a special case of the general process I call ‘smoothing’, of which more familiar examples are pronunciations such as faə, paə for ˈfaɪə, ˈpaʊə fire, power. I describe it pretty gnomically in LPD in the note on Compression. Logically, I think we need to distinguish smoothing (= laxing of a tense high vowel, or loss of the second element of a diphthong) from compression (= reduction of two syllables to one). In any given instance you might theoretically have one or the other or both or neither; but I have always been sceptical about the possibility of compression without smoothing (e.g. monosyllabic faɪə, with a putative phonetic triphthong), although other writers seem to accept triphthongs as a possibility in English with little hesitation. Thus being ˈbiː.ɪŋ can alternatively be ˈbɪ.ɪŋ (smoothed) or bɪːŋ (smoothed and compressed), but hardly monosyllabic *biːɪŋ, just as fire ˈfaɪ.ə can become ˈfa.ə or faə (or the further derived faː), but in my view can hardly be monosyllabic *faɪə. There’s an issue how best to transcribe the smoothed form of the underlying long vowel or diphthong: do we write it with length marks (as I did in AofE) or without (as I do in LPD and here)? How do I transcribe smoothed throwing? ˈθrəɪŋ, ˈθrəːɪŋ or ˈθrɜːɪŋ? What do we do if slower ends up sounding identical to slur slɜː, as it may? Where’s my lawn ‘myrrh’? We normally transcribe RP theory as ˈθɪəri, since it’s an exact rhyme of dreary ˈdrɪəri and weary ˈwɪəri. But I suppose that underlyingly it is (or was) ˈθiːəri, and that in this case the smoothing plus compression has been lexicalized. This whole discussion applies, I think, only to RP and certain local accents of England, and in particular to varieties such as Norfolk. Probably wisely, when teaching EFL we don’t mention anything beyond at most the fire, power types. With the Eurovision Song Contest being held in the capital of Azerbaijan, we had ample opportunity last weekend to hear how people pronounced the name Baku. In LPD I gave it as (ˌ)bɑːˈkuː, with an alternative bæ-. What the British TV and radio presenters actually said was usually ˈbækuː. If the account of Azeri (Azerbaijani) in Wikipedia is to be believed, native words in that language do not have k, which appears only in borrowings “from Russian or French”. The letter k generally corresponds rather to a palatal plosive c. In Azeri Baku is actually spelt Bakı, with a Turkish-style dotless i at the end denoting a close unrounded back vowel, and (according to Wikipedia) is pronounced correspondingly as bɑˈcɯ. In English, I guess Americans would usually still go for bɑːˈkuː. I wonder what Brits in the oil business who have dealings with Azerbaijan say? Probably they too, like the TV presenters, prefer ˈbækuː, and that’s what I ought to give in LPD as the British anglicized form. Unlike ordinary Turkish, the related Azeri has two open vowels: not only a back ɑ but also a front æ. Before the breakup of the Soviet Union, when Azeri was still written in the Cyrillic alphabet, this vowel required an extra non-Russian letter. The one chosen was visually like a schwa, Әә, and this has been carried over into the Latin-letter script used nowadays, as Əə (blog, 15 August 2006). On a different issue, I wrote on Monday about the ˈɡlæsiəz or (compressed) ˈɡlæsjəz we’d seen and walked on. 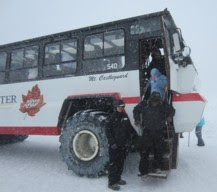 Our tour guides both on the coach trip and on the cruise were of course north American, so they called them ˈɡleɪʃɚz. It was interesting to observe our all-Brit group hesitating between our own usual pronunciation and the different model put in front of us by our authoritative guides. wʌn ə ðə prɪvəlɪdʒɪz əv biːɪŋ rɪtaəd ɪz ðət aɪ kəŋ ɡəʊ ɒn hɒlədeɪ wenevr aɪ fiːl laɪk ɪt, wɪðaʊʔ wʌriɪŋ əbaʊʔ tɜːm deɪts ən ðə laɪk. ən ðæts wɒt aɪv dʒʌs dʌn. ɪts sɪks mʌnθs ɔː səʊ sɪns wi lɑːs hæd ə blɒɡ entri ɪn fənetɪk trænskrɪpʃn, səʊ aɪ θɔːt aɪd riːstɑːʔ maɪ blɒɡ tədeɪ baɪ ɒfrɪŋ dʒʌs ðæt. ɑː hɒlədeɪ wəz ən ɪskɔːtɪd tʊə ɪn ðə kəneɪdiən rɒkiz plʌs ə kruːz tu əlæskə. ðə fɜːs wiːk wəz ɪn ðə rɒki maʊntɪnz. wi fluː tə kælɡəri, ən frəm ðeə hæd ə θriː deɪ kəʊtʃ trɪp steɪɪŋ əʊvənaɪt ɪn bænf, leɪk luːiːz ən dʒæspə, fɒləʊd baɪ ə tuːdeɪ treɪn raɪd daʊn θruː kæmluːps, fɪnɪʃɪŋ ɪn væŋkuːvə. ðə həʊl θɪŋ wəz mɑːvləs, bəʔ kɒntrəri tə maɪ ekspekteɪʃn aɪ faʊnd ðə rəʊd pɑːt iːvn betə ðən ðə reɪl pɑːt. wi hæd ə veri nɒlɪdʒəbl draɪvə ənd wər eɪbl tə stɒp evri aʊər ɔː səʊ tə stretʃ ɑː leɡz ən ədmaə ðə siːnəri. ðə haɪ pɔɪnts fə miː wə ðə ɡɒndələ raɪd tə ðə tɒp əv sʌlfə maʊntɪn əʊvəlʊkɪŋ bæmf, ðə ɡrɪzli beə wɪ sɔː əʔ ðə saɪd əv ðə rəʊd əz wi wə draɪvɪŋ əlɒŋ ði aɪsfiːld pɑːkweɪ — siː ðə fəʊtəʊ aɪ tʊk — ən draɪvɪŋ raɪt ʌp ɒntu ə ɡlæsiə ən wɔːkɪŋ əbaʊt ɒn ɪt ɪn ə blɪzəd. ən əv kɔːs evriweə ðə maʊntɪn siːnəri wəz breθteɪkɪŋ. fə ðə treɪn dʒɜːni wi sæt ɪn ə ɡlɑːs tɒpt ɒbzəveɪʃn kɑː əz wi sneɪkt əlɒŋ θruː maʊntɪn ɡɔːdʒɪz ən dens fɒrɪss. ðɪs wəz nɒt laɪk ə jʊərəpiːən ɔː dʒæpəniːz treɪn, rʌʃɪŋ pɑːst evrɪθɪŋ ət tuː hʌndrəd kɪləmiːtəz ən aə. rɑːðə, wi trʌndld veri dʒentli əlɒŋ, wɪð friːkwənt stɒps əʔ pɑːsɪŋ pleɪsɪz səʊ əz tu əlaʊ ə treɪn kʌmɪŋ ɪn ði ɒpəzɪʔ dərekʃn tə pɑːs əs ɒn wɒt wəz məʊsli ə sɪŋɡl træk laɪn. ðə sekəm wiːk wəz ðə kruːz. ɑːftr ə tuː deɪ steɪ ɪn væŋkuːvə wi ɪmbɑːkt ɒn ɑː ʃɪp wɪð tuː θaʊznd ʌðə pæsɪndʒəz ən set seɪl təwɔːdz əlæskə. ɑː fɜːs stɒp wəz ət ə fɔːmə sæmən kænəri ɒn tlɪŋɡɪt lænd, weə wi frəʊz ɒn ə draɪv θruː ðə fɒrɪst ən əlɒŋ ðə ʃɔːr ɪn ən əʊpənsaɪdɪd viːɪkl. 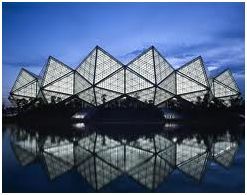 bət aɪ dɪd hɪə sm spəʊkən tlɪŋɡɪt. frəm ðeə wi kəntɪnjuːd nɔːθwədz tə riːtʃ ðə vɑːst hʌndrəd kɪləmiːtə waɪd hʌbəd ɡlæsiə, weə wiː hæd səm eksələnt fəʊtəʊ ɒpətjuːnətiz. ðə bluː kʌləreɪʃn əv pɑːt əv ðə ɡlæsjər ɪz səpəʊzɪdli djuː tə ðə fækt ðəʔ ðæʔ pɑːt əv ði aɪs həz biːn kəmprest baɪ ðə weɪt əv ði aɪs əbʌv ɪt fə θaʊznz əv jɪəz, pʊʃɪŋ aʊt eni rizɪdjuəl bʌblz əv eər ən səʊ ɔːltərɪŋ ðə rifræktiv ɪndeks əv ði aɪs. æz wi rɪtɜːnd təwɔːdz kænədə wi kɔːld ɪn ət dʒuːnəʊ ən ketʃɪkæn, bəʊθ veri smɔːl taʊnz wɪð nəʊ rəʊd kənekʃnz — ju kən əʊnli ɡet ðeə baɪ siː ɔː baɪ eə. frəm dʒuːnəʊ wi tʊk ən ɪkskɜːʃn ɪn ə fləʊt pleɪn, wɪtʃ ɡeɪv əs wʌndəfl vjuːz əʊvə ði ʌntʌtʃt aɪs əv maʊntɪn sləʊps əŋ ɡlæsiəz. ɪf jɔːr ɪntrəstɪd, ðər ə plenti mɔːr əv maɪ fəʊtəʊz hɪə. 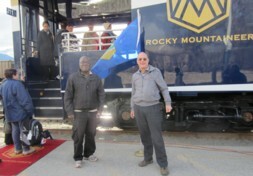 Calgary to Yoho, Lake Louise to Vancouver, Alaska. 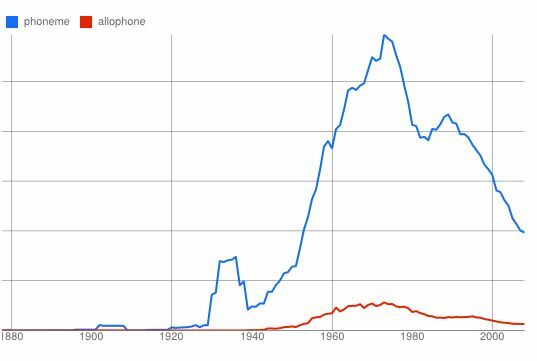 Here’s another Google n-gram (blog, 13 April), this one for the words phoneme and allophone. The OED’s first citation for phoneme in its modern sense is dated 1896. As the n-gram shows, though, it was only in the 1950s that this term really took off, reaching a peak around 1970. It was in 1968 that Chomsky and Halle’s The Sound Pattern of English was published, the first widely influential publication to rubbish the whole notion of the phoneme as the basis of phonological analysis (though Jones’s great SOAS rival Firth had attacked it years before). This explains the abrupt decline of the term after that date. The OED records only one instance of the popular misuse of the term ‘phoneme’ to mean nothing more than ‘speech sound’, often encountered among speech and language therapists, language teachers, and drama teachers. That is from the novelist Kingsley Amis. 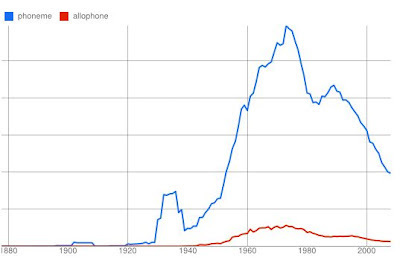 The graph shows allophone coming into use around 1940. The OED’s first citation, from Benjamin Lee Whorf, is dated 1938. Daniel Jones seems to have used the term only very rarely, speaking rather of ‘sounds’, the ‘grouping of sounds into phonemes’, and the ‘members’ of a phoneme. The only case I have found of Jones using the term ‘allophone’ is in The Phoneme: its Nature and Use, §24. When a phoneme comprises more than one member, it generally happens that one of the sounds seems more important than the other(s). … Such a sound may be termed the “principal member” or “norm” of the phoneme. The other sounds in the same phoneme may be called “subsidiary members” or “subsidiary allophones”. Robins (for whom I used to write linguistics essays when I was a postgraduate) explains the orthodox position much more clearly. Although many modern phonologists routinely pooh-pooh the notion of the phoneme, there seems to be no satisfactory replacement term or concept for us to use in its stead. I shall now be away for three weeks. Next posting: 28 May. Commenting on Monday’s blog, Mark Leavitt mentioned being misled by the spelling of the word epitome, which caused him to pronounce it “eppy-tohm”, i.e. ˈepɪtəʊm, instead of the usual ɪˈpɪtəmi. Greek ἐπιτομή has four syllables. I hope he was indeed ˌmɪsˈled rather than being ˈmɪzl̩d. I can remember once doing a double-take after misreading seabed (the ocean floor) as siːbd. Not to mention ɪnˈfreəd (infrared) rays. Along with epitome we might mention apocope (Gk ἀποκοπή) and syncope (Gk συγκοπή). I have heard -strəʊf in apostrophe and catastrophe, but only as jocular intentional mispronunciations. Some of you may have been puzzled on seeing sundried tomatoes on the shelf at the supermarket. Nothing to do with sundry, not ˈsʌndrid: they’re sun-dried, ˈsʌn draɪd. I suppose the best-known case of a spelling pronunciation of this kind is seeing the word awry and saying it aloud as ˈɔːri. Strangely enough, the only word with orthographic awry actually pronounced ɔːri, as a model, seems to be outlawry, hardly an everyday word. Pronouncing awry as ˈɔːri rather than as əˈraɪ is not a malapropism, since it does not involve the confusion of one word with another. I don’t think we have a particular term for this kind of thing, such as would enable us to distinguish the awry type from run-of-the-mill spelling pronunciations such as often with a t, falcon with an l, or Antigua with a w.